November 24, 2015 December 6, 2015 Steve B. There was a time when I was absolutely obsessed with Google Earth. When this product came out, it was just amazingly fascinating to ‘fly’ around the globe checking out random far away places. I’d scroll over to places that I’d planned to visit as well as well-loved places that I’d already traveled to. 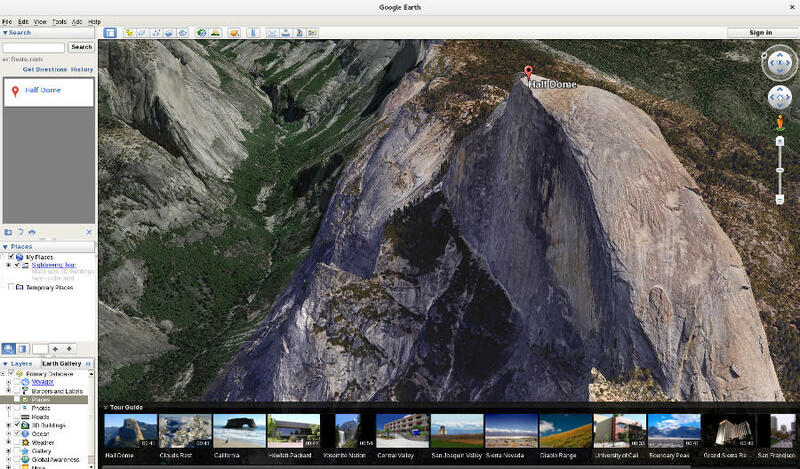 Check out Yosemite National Park because it looks really cool on Google Earth ( hint: it’s even better in person!) because the landscape renders so accurately and the new textures are so crisp that you can practically smell the pines while you get vertigo from perching on the precipice of Half Dome. Gives me chills just looking at my own screen shot. First off, head on over to the Google Earth download page and download the 32 bit or 64 bit version depending on your hardware. And that’s pretty much it. I know, not very exciting. There was a time when this was a little more complicated, requiring the installation of a number of dependencies (see below), but this time around, Fedora 23 seems to have everything it needs to run Google Earth 7 flawlessly. Note: As mentioned, you may need to install some dependencies to get Google Earth to run properly on your particular installation. If you are having trouble installing Google Earth on your current Fedora install, check out this post on the Fedora Forums for more info.